Introduction: I’ll admit I liked how this kind of article turned out the first time when I looked back at my first ten hours of Batman: Arkham Knight and I thought I’d turn my eye to the current object of my affection Disgaea 5. Before I start I’ve got some disclosing to do I’ve barely touched the story I’m only at Chapter 4 meaning a lot of the jokes and stuff are in front of me still; this tends to be how I play Disgaea as I basically live in the item world where delving deep powering up items and characters is the name of the game. Furthermore this is not a review of any kind as I’m really personally invested in the series, I can not even pretend to be impartial. At times I’ll be raving about this game in this post as again these are just my personal thoughts and observations. 1) Puns, References, and Easter Eggs: As I have not played through the story that much I’m undoubtedly missing somethings, however there are just some amazing jokes and references. While this may be the lowest form of comedy due to its ease of use when it’s used well it can provide a lot of laughs. As it stands my favorite remains a simple weapons name; currently Red Magnus is using a weapon I have around Lvl 105 as its kinda weak. The only reason I keep it around (and spend a good 45 minutes grinding it to usability) was its name, Attaxe on Titan. It’s jokes an elements like these that make Disgaea games so welcoming, while other franchises try to hide their Otaku spirit Disgaea embraces it whole heartedly. That is the only pun and its certainly not the best but I think it speaks to the spirit of the game. Edit: Just came accross this one. What seems like an Ultimate move from the Bow. Known as “Sword Inferno” where the user summons a world of swords and attack using the swords as infinite arrows. Very reminiscent of Archers Unlimited Blade Works technique in Type Moon’s Fate Stay/Night. 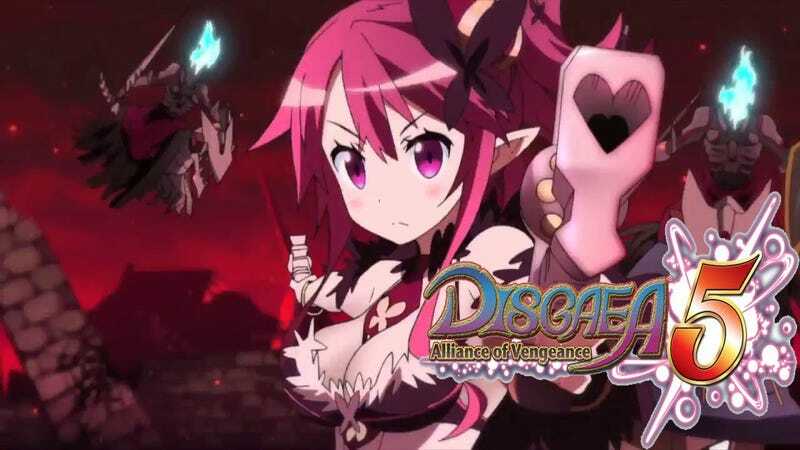 2) Characters: Disgaea 5 lives and dies by its characters. Disgaea is a classic because of Laharl, Flonne, and the rest while Disgaea 3 failed because... who were they again... ah who cares. So far Disgaea 5 for me is only par with 4 although there are some script and voice issues (this post deals with that quite well) all around the characters have heart. Red Magnus is just a great goofball and Seraphina a self-described temptress is certainly more then a pretty face and short skirt. All around they’re a lot of fun and I could really see myself leveling them up to 9,999 like 20 times or so. 3) Colour: I know its a little weird to put something so basic on this list but it stands out. In a sea of bland colour palets Disgaea 5’s just POP! Brilliant reds, deep blues, and vibrant greens with everything in the middle, the worlds (even the random designed ones) has a vibrancy that is missing in most games. The mania of the colour scheme really does a lot to set the tone of the game. If you’re tired of greys and dour pastel like backgrounds you really need to check this out. Another great use of colour is during “Revenge” sequences when your characters start burning in a bright golden light reminiscent of the Super Saiyan transformation from Dragon Ball Z. 4) Technical Performance: Bar none this is the best performing Disgaea I’ve ever played. You would think being so graphically limited that Disgaea would run perfectly on any system. However on the PS2, PS3 and especially the Vita the frame rate shocks could really take you out of the game. However it appears rather then cramming more onto the screen at all times Disgaea 5 has tuned everything up frame rates remain solid, effects fluid, and movement crisp. All around this is without any doubt the best performing game in the series. Also at times the game does throw TONS of enemies at you, if you “Cheat” you can get more enemies on the field too. All the better to grind I say while blasting them away with an Omega Star. 6) Subclasses: Another a major change is the idea of “Subclasses” which you can assign to your main fighters. Now your heroes can power up other classes of monsters and demons. This makes unlocking the superior fighters quite easy and far less of a grind then previous games. No longer do you need to keep using a worthless Thief to unlock the far better Ninja now you can just set the subclass and it’ll come naturally. 7) Squads: This particular entry is probably my most negative as it fits into accessibility but in a bad way. Replacing the world effects from Disgaea 4 Squads are placements you can set to give your characters extra bonuses. Experience from the leader or mana, makes some characters giants for a few turns, ect. They are fun for a time but once you realize how to use them you realize they are OP. The “Giant Squad” which is my favorite is also too powerful. In their giant forms any character becomes a sweeper able to use a cheap special attack damaging everyone around them. Placed on the right characters (I use my Iron Knights for suitability) they can sweep well past Floor 50 of the Item World. 8) Classes and Monsters: One great thing about a new Disgaea game is the new classes you get to play around with. Sadly the past couple of entries in the series (4 and D2) have been safe entries primarily filled with long time classes. This does not seem to be the case here with many new classes including humanoids available. My personal favorite is the Pirate class which I named Jack, however the most significant is the Maid. As her passive ability lets her use items and then attack or move, previously items were ALWAYS a last resort to stave off death now they are viable within the proper set up. To outsiders this may not seem like much but to longtime fans of the series this is a revelation. 9) Grinding: Disgaea is the grind. If you don’t like grinding you wont like this game its really that simple. However Disgaea 5 doesn’t FEEL like grinding its partially due to the changes I detailed above but there is something else that makes me feel this way. Progress unlike other RPG’s Disgaea 5 does not hold back the progress especially early on. In fact every level you feel progress with all sorts of new stats popping up all the time. Mastery now determines what class you can create, every spell and skill powers up with use. One character still uses only a Lvl 3 Star spell but due to my spamming of it early on it can hit almost anywhere on the field, he’s now a magic sniper. Basically these changes as opened the game up to the way you want to play it. It’s kinda strange but in a game about grinding your characters to 9,999 over and over again decoupling skills from level was their best choice IN DECADES. 10) It’s Great: As I said this isn’t a review but I can’t end without giving my view as a whole. This game is amazing I play it in the morning, I play it before bed, and I write about it when I can’t play it! Honestly this was almost not written as I decided I’d rather play Disgaea 5. Right now two TV’s are set up in my living room so I can play this while watching TV that’s how much I love this game. I know its not for everyone but if you’re a fan of the series or tactics style games you have to play this. If for no other reason I can have somebody else to talk and laugh with. Anyways I hope you enjoyed reading this as much as I had writing this. If you’ve played the game leave comments if you haven’t well leave comments anyways.